You can import ticker symbols into your StockMarketEye Watchlists via Comma-separated values (CSV) files. You can create CSV files via most spreadsheet applications such as Microsoft Excel or OpenOffice.org Calc. 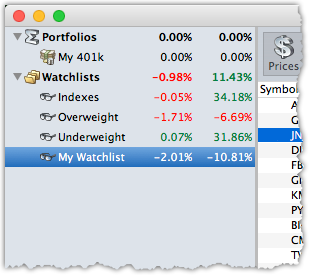 StockMarketEye reads your stock symbols from the CSV file, one symbol per line. Optionally, you may include additional columns in each line in order to specify additional information for the symbol. The table below lists the columns accepted by StockMarketEye. NOTE: The order of the columns in the CSV file must be the same as that specified in the table below. NOTE: You may include a “header” line, but it is not required. If the “header” line is included, the first cell must contain the word “symbol” or “ticker”. Bold column names are mandatory. Others are optional. 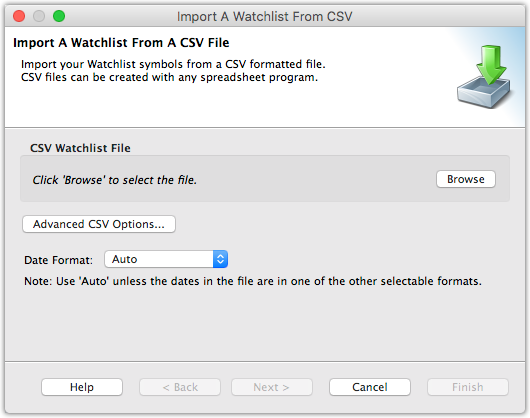 You can download an example CSV watchlist file here. The following table describes the columns of the CSV file in greater detail. Ticker Symbol Mandatory The ticker symbol to add to the Watchlist. You can find valid ticker symbols using StockMarketEye’s built-in ticker symbol lookup. import will not warn about symbols for which it can not retrieve quotes or historical data. This column is mandatory and must always contain a value. Watch Start Price Optional The starting watch price. If not specified, the current last-trade price will be used. Watch Date Optional The date on which you started watching this stock. Typically this corresponds to the date on which the stock traded at the Watch Start Price. If not specified, the current date will be used. Comment Optional Any comments you want to remember about this particular security. This column is optional and can be left blank. Name Optional The name of the company or fund represented by the ticker symbol. This column is optional and can be left blank. 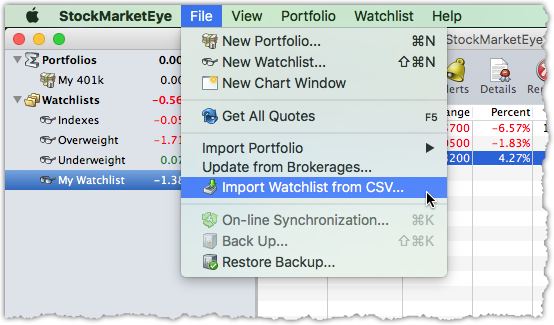 Once you have created a CSV file containing your ticker symbols, you can import it into StockMarketEye with the following steps. 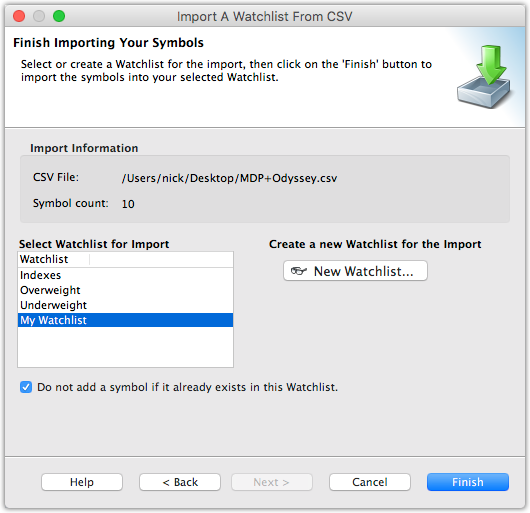 Select the CSV file containing the watchlist symbols that you want to import into StockMarketEye. This data will be imported into a new or existing StockMarketEye watchlist that you select in Step #3. Once you have entered an existing CSV Watchlist symbols file, click on the “Next” button to move to the next step. 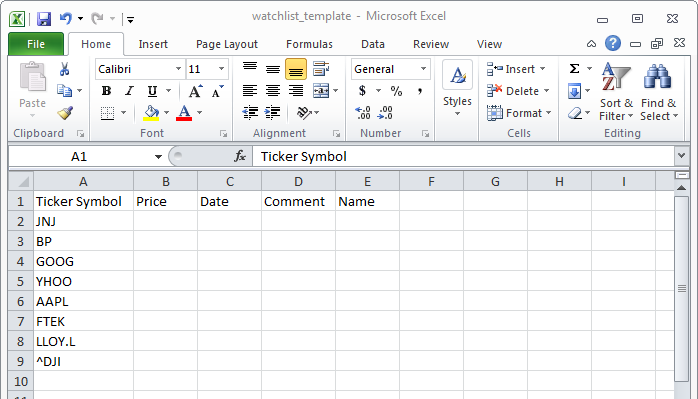 Finish the import of the Watchlist symbols by selecting a Watchlist into which the symbols will be added. You can either select an existing Watchlist, or create a new one. Click on the “Finish” button to complete the import. The symbols have now been imported into the selected Watchlist.